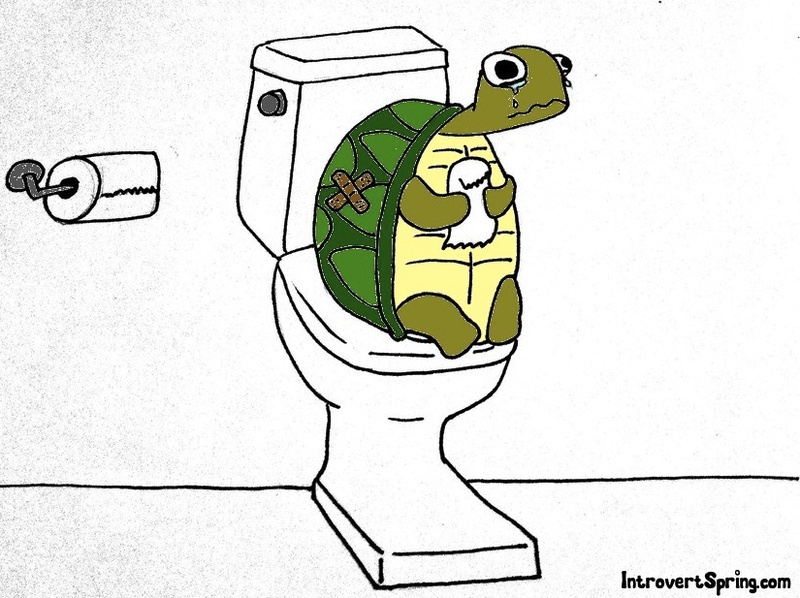 Like turtles, introverts arm themselves with a protective outer shell. This comes in handy when we face people and situations that endanger both our energy levels and our self-esteem. It also helps us survive insults and criticism from insensitive extroverts. Unkind words bounce off our shells instead of penetrating our soft, squishy interior. Our shell manifests itself in our guarded nature. We tend to be slow to trust new people and slower still to reveal our true selves to them. For some introverts, metaphorical armor isn’t enough. Years of enduring hurtful comments from brash extroverts (ie. “you’re weird”, “party pooper”, “you’re too quiet”) can cause us to develop a porcupine-like exterior. Our spikes begin to come out at the mere mention of the word “extrovert”. A few years ago, while standing in line in front of Darcy’s Pub, I encountered an introvert’s worst nightmare: the drunken, obnoxious extrovert bully. I’m sure you’ve come across his species before. This kind of extrovert is loud, pushy and completely oblivious to the feelings of others. He relishes spewing slurred insults at anyone who seems different. He is also master of pointing out the obvious (ie. “you’re really quiet”). Words escaped me. A vicious retort formed in my mind, but couldn’t find its way past my lips. Instead, one of my loyal and totally fierce extroverted girlfriends unleashed her fury on him. But it was too late. The damage was already done. This experience and several others sharpened my quills and made me more leery of all extroverts. Of course, the porcupine effect isn’t the only way that introverts react to extrovert bullying. Often, neither sword nor shield can protect us from hurtful words and situations. Instead, we internalize things. We begin to believe that something is wrong with us. We become like a wounded turtle whose shell has been ruptured. So, what happens when a turtle’s shell is penetrated and her gummy green interior is pierced? Well, if this tortoise is anything like me, she’ll lock herself in the bathroom and cry for 20 minutes because someone told her she’s strange (don’t tell anyone, but this actually happened to me last week – can you recognize me in the picture below?). "Has anyone else had a wounded turtle moment like mine? Do you become a prickly porcupine around extroverts? How thick is your shell? Please share your thoughts and experiences in the comments section below." I didn't write the article - but I could have. I have been bullied by Extroverts for being quiet. Steph, a wonderful way to communicate your feelings and thoughts. Yes, a very familiar shell and protection from overbearing, aggressive, domineering people of the world. My shell grew very sharp thorns and a mean-spirited tongue. Obviously, people don't like to see and hear an old woman, angry with life's challenges, and wonder what happened to that sweet young thing? Well, that sweet young thing grew up, developed some mean spirit and life is better. When I get tired or don't feel good, I feel guilty for developing my defenses, and a new day comes and I feel my vinegar again. Life is very, very good. Thanks, dear friend! You made my day! Thank you Joan - you made my day too. So happy that I am here for you. Anytime you need me Joan - I am here to support you. Wonderful dear friend. Thank You !! Keep putting it out .I am getting it. Extroverts used to intimidate me. I have learned, and am continuing to learn, that they are a source of information I can draw from. Now that I see them as a source of knowledge, and use them that way, they feel listened to (something extroverts want, they thrive upon attention) and I gain the data I love. Whether or not I find it useful is another matter. But I generally find they aren't going to do much with it, and I can do more with their knowledge then they can, so it all works out....I know that sounds really egotistical, but if you worked where I work, you would understand. Thank you for your input Liz.